counter punching and posturing for the big blow. In basketball terms that means every dribble, pass and shot was contested and getting an open look is tough when locked up in a clinch. With the Blue Devils cold on the offensive end, they relied on their defense which held Florida State to 20.6% from the field in the first half. They went on to take a 19-14 lead to the locker room, thanks to Gerald Henderson who had nine of the Dukies first ten points. "I was rolling. We were kid of stagnant and most of my points came of my defense. When I was able to get out in transition, thats when I was my best," said Henderson of his first nine points. Duke came out to play in the second half warming up on the offensive end and shooting 59% from the field. The hot shooting allowed them to make a quick 9-0 run which put them up 28-15 which eventually became 27 point lead on a Singler three. "The start of the second half, we executed a couple of things that got us momentum plays and we did a couple of things that got us turnovers. We got that lead, you almost get that lead too early, although I am happy we got it, don’t get me wrong," stated Krzyzewski. 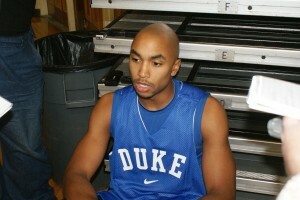 The Gerald Henderson Show continued as well. His teammates call him "G," and on this day he was indeed the "G" man scoring a career high 25 points to go with 5 rebounds and 3 steals. Henderson has been the Blue Devils hottest player and he has now scored in double figures in seven straight contests. “Henderson was the star for us today. I thought his physicality, his athletic ability to create some shots was huge," said Krzyzewski. Without Henderson performance, the game could have been lost for the Noles staged a huge comeback cutting to pull withing eight. But they would get no closer for like a punch drunk boxer their legs were weary as was the Devils. Kyle Singler chipped in with 15 points, Smith had 12 points and Scheyer added 9 points. This was the 275th win this decade for the Blue Devils, which is the highest total of any team out there. This was the 1861st all time win which is the fourth highest total in college basketball. The Devils will face yet another hostile environment on the road when they travel to Georgia Tech on Wednesday.